I was wandering around Amman, Jordan on Friday looking for a place to eat a little lunch and having a hard time of it. Most places were closed. It reminded me a little bit of when I was growing up in the South and most stores were closed on Sundays because of Blue Laws. Why were they closed here on Friday though, you ask? Because in the Muslim World, Friday is our Saturday. Actually, it is a lot closer to what our Sunday was a few decades ago, ergo my Blue Laws reference. It comes down to this — the weekend around the world isn’t the weekend that we are used to in the West. Here, in the Muslim world, the weekend is Friday and Saturday. Sunday is the first day of the working week (which actually makes some sense, since Sunday is supposed to be the first day of the week). Until reforms just during the last decade, the weekend in most Muslim countries was actually Thursday and Friday, but they changed it to Friday and Saturday to more accommodate the worldwide financial markets’ typical opening and closing times. Why Friday in the Muslim world? Because that is the day of mandatory prayers, called Salat al-Jumu’ah. There are Five Pillars of Islam and one of them is that one must pray five times a day, as specifically designated times, facing towards the holy city of Mecca. These prayers can all be done on your own at any location, except for the mid-day Friday prayer. The Friday mid-day prayer is compulsory (for all men over the age of 10) and must be done at the mosque. Which leads to another interesting component of Fridays here in the Middle East — at least here while things are a bit unsettled politically. 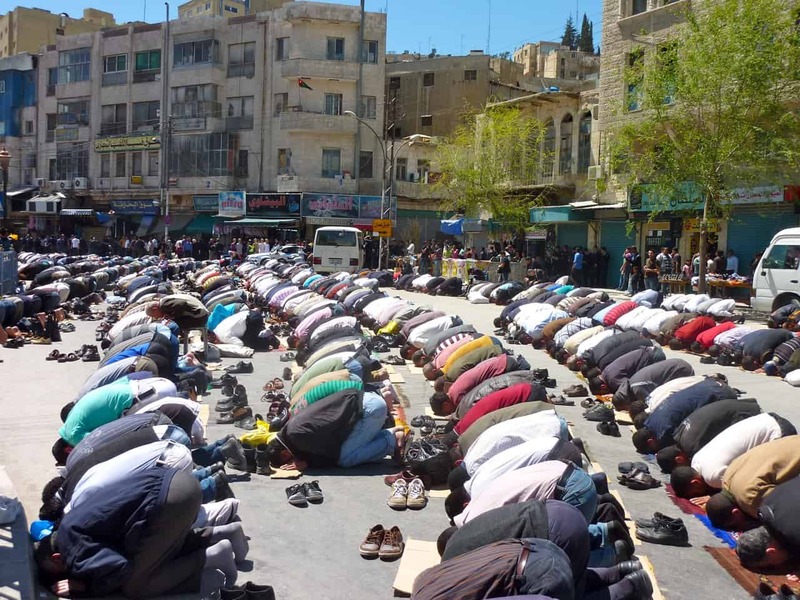 Because a large number of people attend Friday prayers, to the extent that they regularly flow out into the streets because there isn’t room inside for everyone, it provides the ability for the population to get all fired up at the same time. 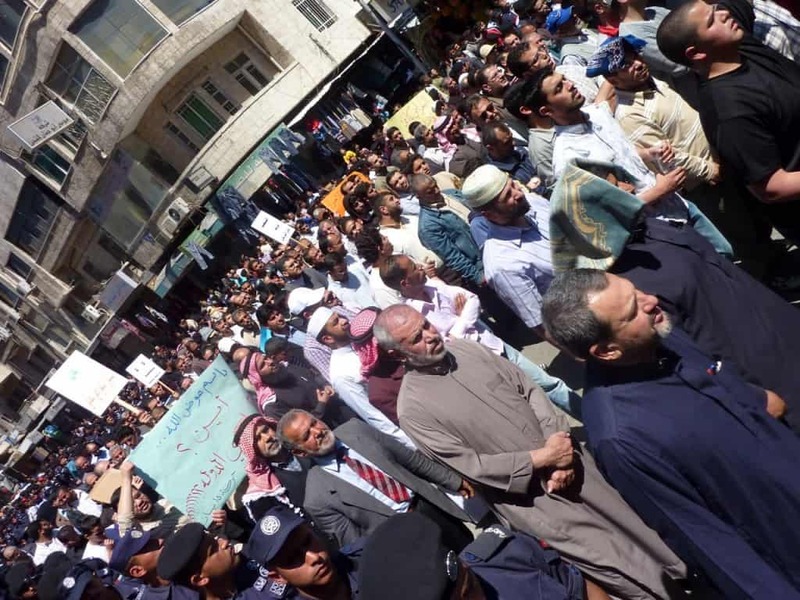 As some of the unrest in the region is fueled by Muslim clerics wishing to see some big changes at the top, getting everyone fired up at the same time every Friday is a heck of a political tool. Ergo the Friday “Day of Rage” that you see on TV sets back in the States. Here in Jordan, things are quite calm. From what I can gather, Jordan’s King Abdullah II is actually pretty popular. He was also one of the first leaders in the region to make some quick reforms when the winds started blowing next door in Egypt. Even so, there have been some protests here in Jordan, although not any violence that I am aware of. People here seem more concerned that some of the problems that are more visibly bubbling up on their northern border, with Syria, may boil over and cause trouble in the area. 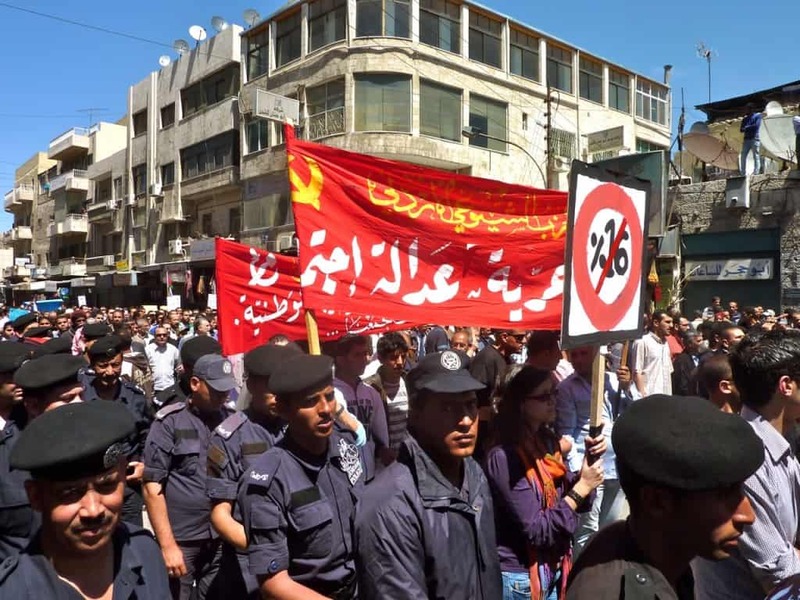 But for now, there is almost nothing of anything going on in Jordan. So, if you are thinking about any travel in the Middle East right now, in my opinion, Jordan is very much a safe destination. I’ll be writing a good bit about my travels in Lebanon in the coming days and that is also quite safe. Syria seems to be rocking back and forth a bit, but it isn’t on most people’e tourist agenda anyway (although it is a truly fabulous country). And I’ll be down in Egypt in a matter of days, but I imagine the most news you are going to get out of me there is how warm and sunny it is and how perfect the conditions are for diving, an occasional beer, writing, and a nighttime cigar overlooking the tranquil Red Sea. And I wish I would have stopped to take this photo of the Citadel right there in Amman or joined my friends Dave and Deb around the corner at the Feynan Eco Lodge — what a spot! Jordan Travel Guide Royal Automobile Museum: An Homage to King Hussein in Jordan Madaba Mosaic Map Back to one of my favorite countries. Which one, you ask? I have a colleague (at work), who’s always wandering between Switzerland and Bahrain – it must be really confusing to be switching your weekend every couple of weeks! I follow Egypt quite closely, and it seems that the situation, although still uncertain with the next elections coming up in september, has calmed down. I’m so jealous about you diving in the red sea! Please take underwater pictures! I suppose if you timed it right, you could do weekend and then more weekend 😉 As to Egypt, I agree. Seems like things have calmed down a good bit, although I’m not sure the elections are going to mean too much in the end. We’ll see. Great update, sounds fantastic. Will be looking forward to some of those views you enjoy whilst puffing on that cigar. Safe travels. many thanks, Matt. I look forward to getting those written… and those cigars also. Yeah most Muslim countries follow the Friday/Saturday weekend except Malaysia and a few other. i always wondered what it was like during prayer times- Great update! and can’t wait to read about Egypt! and I can’t wait to get to Egypt — beach time! Yeah, I’m working a project between Kuwait, and it has been our significant different point when we made work schedule. Interesting. Great piece. thanks Juno! I need to get over to the gulf side at some point also. Thanks for the update on the ground. Excited for my trip to Jordan! Also, appreciate the explanation of why revolutions happen on Fridays in the Middle East. I hadn’t thought of that! You will really love Jordan. Tons of stuff to do here and a really interesting country, especially the long, long history. And in Saudi, the week-end is Thursday and Friday. Friday being the equivalent of our Sunday. You have to live here, or travel through this region, to get the hang of it, and I still battle with the concept. Great read. Keep posting. Yea, from the research I did, I thought that was the case in Saudi, but wasn’t 100% sure, so I didn’t mention it. Thanks for the info. Interesting how culture changes our view “weekends” based on where we travel. I know people from Jordan and Lebanon and would love to visit both of those places. Beirut is supposed to be a really great place so look forward to hearing more about Lebanon! I haven’t been to the gulf side yet, but I love all the countries on this side. Great places and people. Oh the things you never think about until you travel. It makes complete sense when you told us about Friday being our Saturday but I know I wouldn’t have really thought about it until I was in country. Yea, you pick up on it pretty quick when you get here, but it is a little difference that is interesting, for sure. Then again, the differences are what I like most about travel. The pictures are great Michael. Looking forward to your tales of Egypt though and your diving experience. My friend told me it is meant to be one of the best sites in the world for diving but I could not pluck up the courage to do it. Thanks. Looking forward to a bit of diving, but less than I originally thought. My underwater camera housing is shot, so no scuba shots for me this time though. This information is stuff I just recently learned while researching for my trip to the Middle East. I am so glad you are there. I am also glad you are informing people that it is safe. It really does make more sense for the weekend to start on Friday but here in the states we need Sundays off for church services so would guess this is why we have it the way we do. The Middle East is sounding better and better. Am digging your march photos, interesting that the police let it go by peacefully. Michael, I really enjoyed this. I vaguely remember when a friend visited Jordan a couple of years back he mentioned the differences in their weekend days to ours, but this is the first time I’ve read up on it. Completely fascinating, that mid-day prayer picture is unreal! Jordan and UAE are a coupe of places where it is moderately safe. As long as you don’t let your guard down and are aware of your surroundings your usually fine. I transited both places for several years and I won’t say they are eager to embrace westerners but they are a lot more tolerant.